Credit Suisse (CS) has announced it will pay a portion of its bankers’ bonuses with a structured note instead of cash. The note pays a fixed coupon of around 6% per year, and is backed by a package of derivative contracts currently in the balance sheet of CS. Since the value of the portfolio is risky, the payout is not guaranteed. In a memo to staff, CS CEO Brady Dougan touts the structured note as a way to address the criticism made against the financial industry’s bonus structures. But is that true? The central criticism is that the relationship between risk and return is out of whack. The principal behind past bonus structures has been “heads I win, tails you lose”. Performance has been rewarded without regard to risk. Losses have been put to shareholders or to taxpayers. A related criticism is that the process for setting bonuses is opaque and managed by insiders, at the expense of shareholders and taxpayers. This makes it unlikely that insiders ever fail to succeed against the benchmarks that are set, and ensures that the system is skewed against shareholders and taxpayers. Does the new CS structured note address these criticisms? It was designed with an entirely different purpose in mind, which is strengthening the bank’s capital position in light of new banking rules. The derivatives portfolio backing the structured note comes from CS’s balance sheet, and CS hopes the move will decrease the measured risk of its balance sheet and improve its capital ratio under the new Basel III agreement. CEO Dougan is straightforward about this strategic objective. But he also wants to advertise the move as addressing shareholder and public concerns on bonus rules. The structured note fails to address either of the two key criticisms. Most importantly, it is terribly opaque. Many details haven’t yet been released, but in his memo to staff, CEO Dougan acknowledged that “Instruments such as PAF2 are inherently hard to value. It’s obviously not something that is traded in regular markets so has to be modeled.” Only an investment banker still locked in a pre-2008 mindset would structure a note like this as a step forward to transparency and accountability? PAF2 represents an effective and real sharing of risk but, nonetheless, we still need to reserve the right to amend this structure in the event of changing requirements. The most likely change would be to amend PAF2 to an instrument that instead of referring to our specific portfolio would reference a public index of credits. In our view this would be just as good for our employee investors. We also need to include a call at market value in case these requirements change so materially that the instrument is no longer effective. If the note were also a real solution to the bonus problem, it would survive changes in the regulatory capital rules that are its real objective. If CS’s management were serious about addressing the compensation problem, they would design a durable scheme, not a one-off gimmick. The scheme would include a clear downside for managers and a clear tie to the long-term fortunes of the bank. Simon Nixon at the Wall Street Journal’s Heard on the Street column mentions UBS’s plan to pay bonuses as contingent convertibles as one example in this direction. Another alternative would be the explicit clawback provisions being pushed by New York City Comptroller John Liu. The key is that managers should not be able to walk away from the future fortunes of the bank, and the scheme should encourage cross monitoring of risks among managers within the bank. And these incentives should be clear to all, inside and out. The CS proposal is not a step forward on this front. 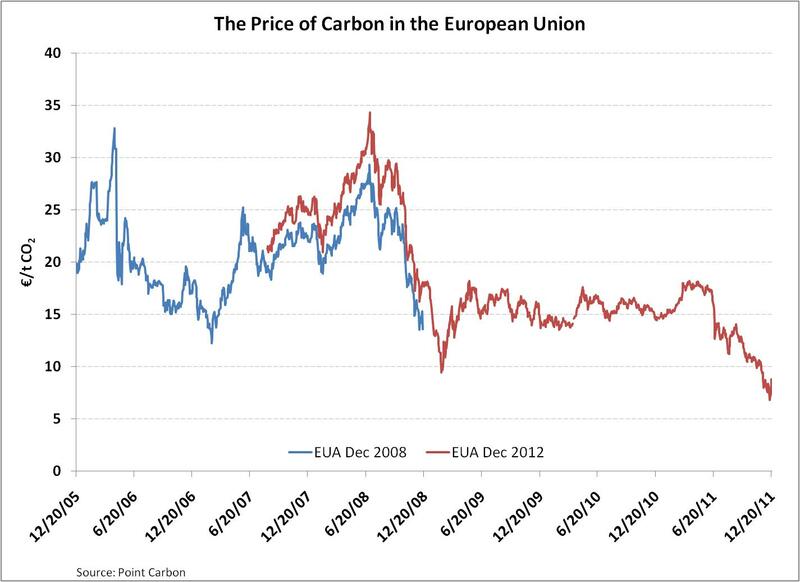 The Great Recession has hit the European carbon market hard. With output down, the demand for allowances is down, and so is the price. As recently as the start of this year, emissions allowances were trading at €14/t CO2. But last week the price was below €7. This is gloomy news for those who want the carbon price to incentivize innovation in low carbon technology. For example, David Hone, Climate Change Advisor for Shell, is one of many who have been advocating that the Union set aside a number of allowances in order to support the price. Earlier this week that proposal moved a step closer to becoming a reality with a favorable vote by the European Parliament’s Environment Committee. The price of carbon subsequently jumped up by 30% on Tuesday on the news. I bring up this news because I think it highlights a weakness in the economic debate about the best means to the end of pricing emissions. The argument revolves around whether or not the government should set the price of emissions, and let companies choose the quantity of emissions, or whether the government should set the quantity of emissions it will allow, and let the market set the price. The former is a carbon tax, the latter is a cap-and-trade system. In a world of certainty, where the cost of abatement by companies is well known, the two are equivalent. When the government sets the price (tax level), it knows the quantity of emissions that companies will choose. Alternatively, when the government sets the cap, it knows the price that will emerge in the market. That’s duality. The lesson from MF Global for the management of a prop trading unit. Much has been said about MF Global, the US brokerage and clearing group that filed for bankruptcy in late October. In March 2010, when Jon Corzine was brought in as the CEO, MF Global’s franchise in brokerage and clearing operations was strong, but had tallied a string of losses. Corzine was tasked with cutting expenses and returning those operations to profitability. But that wasn’t good enough for him. He wanted to transform the firm into a major league investment bank, expanding into market making in fixed income instruments as well as adding asset management, advisory and capital market services. Corzine also sought to transform proprietary trading into a major source of profit for the firm. Proprietary trading was something more to Jon Corzine than simply another line of business. He personally stepped in to make an outsized bet on the Eurozone sovereign debt crisis. The firm took a long position in bonds of financially stretched European countries with loans secured by the bonds themselves. To avoid the risk of refinancing, MF Global arranged the trade to be funded until the maturity of the bonds. If everything went according to plan, for a ten percent haircut on the collateral, the spread between the EU high bond yields and the overnight rate would generate €400-€500 million in profit for the company. As Aaron Lucchetti and Julie Steinberg, of the Wall Street Journal report, MF Global’s Chief Risk Officer, Michael Roseman, warned of the dangers of the trade: he “contended MF Global didn’t have enough spare cash to withstand the risks of its position in bonds of Italy, Spain, Portugal, Ireland and Belgium. He also presented gloomy hypothetical scenarios of what could happen if MF Global’s credit rating was downgraded because of the exposure.” Nevertheless, Corzine held firm and the Board did not restrain him. MF Global’s lenders grew worried over the summer as the collateral lost a good deal of value. They demanded the company post additional margin, and when the company was unable to do so, they called the loans. With no additional credit available to the firm, MF Global had no choice but to liquidate the portfolio at very disadvantageous prices, for the market for bonds of highly indebted European countries is very illiquid. Ultimately, the bad bet forced the company into bankruptcy. There are many lessons that can be drawn from the collapse of MF Global. One that we would like to highlight has to do with the proper place of prop trading in a larger business. We see no problem with standalone prop trading units – hedge funds, as they are sometimes called. When the prop traders are gambling using their own balance sheet, they are forced to fully bear any risk of failure. But when the prop traders share a balance sheet with other lines of business – like MF Global’s brokerage and clearing operations – the danger arises that they are gambling using the capital of other units without paying for it. When MF Global’s bet went bad, it lost more than the price of that bet. It wiped out the long-term health of the brokerage and clearing franchise. That is a dead weight cost produced by having the two operations share a balance sheet. Was that potential cost factored in when taking the original bet? We doubt it. Measuring the capital at risk from proprietary trading is a difficult task. Traders habitually underestimate the risks of their trades and the capital required to run their operation. MF Global structured it’s repo-to-maturity deal to seemingly hedge out key risks, thereby benefitting from an accounting trick that kept its bet off of its balance sheet and out of sight of the market. But that accounting treatment ignored the huge liquidity risk created by the need to hold onto the position to maturity. That liquidity risk put the entire balance sheet of the firm on the line. Ultimately, one of MF Global’s regulators, FINRA, flagged the risk and demanded more capital, forcing more disclosure. One way to discipline traders is to give them their own balance sheet. With no one to blame but their operation, the tradeoff between risk and return is more carefully scrutinized. A stand alone balance sheet isn’t the only tool for disciplining traders, but it is certainly the most reliable. Companies that decide, for whatever reason, to put the proprietary trading unit onto the same balance sheet with other activities, had better have superior disciplinary tools at their disposal than what MF Global had. A Bloomberg article details how a draft of the Volcker Rule uses the structure of trader compensation to distinguish between proprietary trading and market making. Exactly right! The case of the $2.3 billion trading loss at UBS holds many lessons for any company that trades derivatives. Remember, UBS wants to claim its trader was a rogue that victimized the company. There was a time that a bank could shout ‘rogue’ as an effective excuse of senior management. But that time is now long past. There have been plenty of penetrating questions asked about the self-evident shoddiness of UBS’ control systems. Another area that deserves scrutiny is the compensation system. How is a trader’s pay determined? Pay should be for performance. But what counts as performance? The metrics for performance on a proprietary trading portfolio should be different from the metrics for performance by a market maker. A market maker ought to be compensated, in part, for how successfully s/he is hedging trades. For a market maker, outsized gains on the unhedged component should not count towards a bonus, whereas for a trader running a proprietary portfolio, they should. How was performance measured at UBS’ Delta One desk? If the traders were being rewarded based on the total profitability of the desk, then UBS was incentivizing them to speculate, and the Delta One desk shouldn’t be described as customer facing or market making. This same lesson applies to non-financial companies that hedge through their own trading desk. The metrics for performance on hedging should incentivize minimizing risk. The metrics should measure risk reduction. When the desk reports big profits — after netting out the matched positions — that’s a bad sign, not a good one. If you pay out bonuses when bets payoff, be prepared to see some bets that lose big, too. It’s not a rogue trader if the risky bets are rewarded by the compensation system. 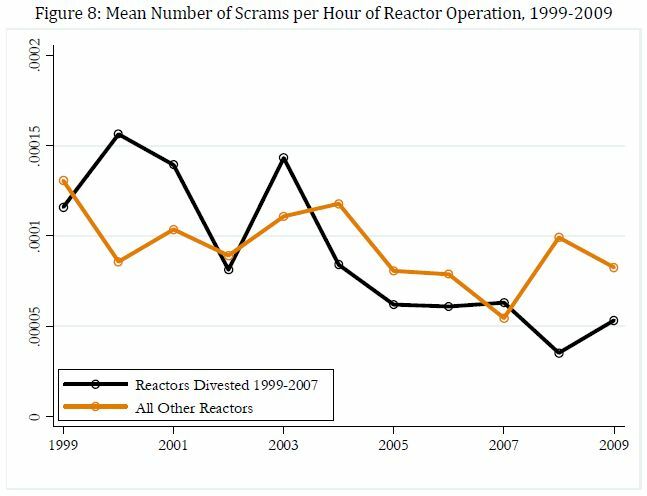 We find that deregulation and consolidation are associated with a 10 percent increase in operating efficiency, achieved primarily by reducing the frequency and duration of reactor outages. At average wholesale prices the value of this increased efficiency is approximately $2.5 billion annually and implies an annual decrease of almost 40 million metric tons of carbon dioxide emissions.